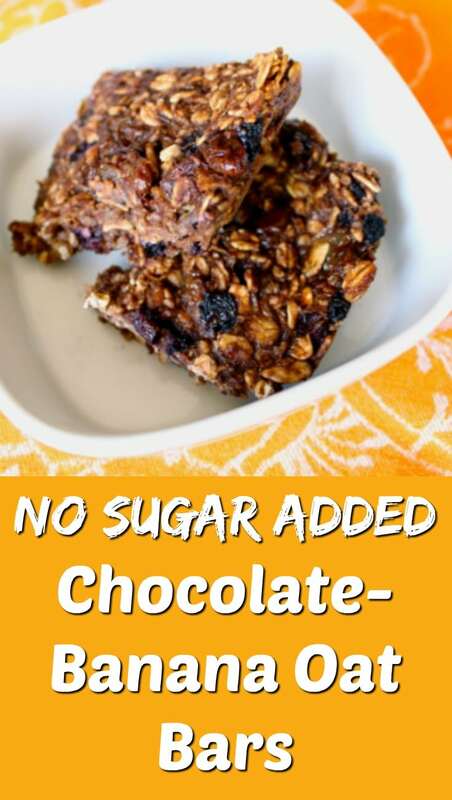 Vegan Chocolate Banana Oat Bars - No Added Sugar! 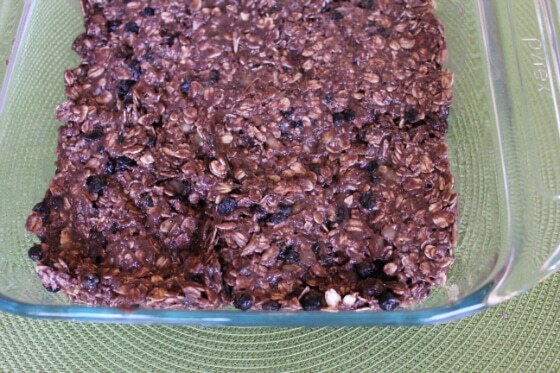 These Vegan Chocolate Banana Oat Bars are a wonderful, healthy dessert. The ripe banana and raisins add just enough sweetness. 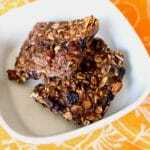 These simple oatmeal health bars are great served as an after-school snack for kids or mid-afternoon treat for grown-ups. There is no added sugar in these vegan oat bars. 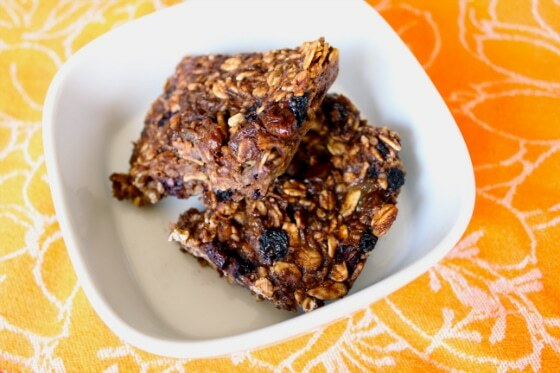 These bars are sweetened only with one banana, plus the other naturally sweet ingredients. I originally made these bars to take on the road this weekend to San Diego, but I had to cancel that trip based upon bad weather coming into the area. I was bummed to miss the trip, but I loved how these bars turned out. You can even serve them for breakfast, yet they are sweet enough to qualify as a healthy dessert as well. 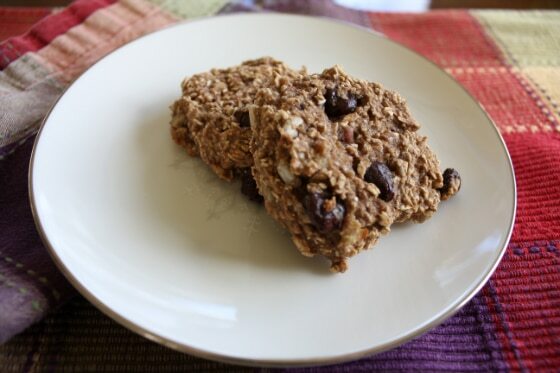 Here’s how I made these yummy oatmeal bars. Bake for 20-25 minutes in a 350 degree oven. Let bars cool and then enjoy or refrigerate to eat later. I tried them both hot out of the oven and chilled overnight in the fridge. It was a toss-up as to which way tasted better. They have a wonderful, chewy texture with the flavor of bananas and chocolate. Very satisfying and healthy, the perfect combination! This is a wonderful, healthy dessert with no added sugars. The ripe banana and raisins add just enough sweetness. Lightly spray an 8 x 8-inch glass baking dish with nonstick cooking spray and set aside. 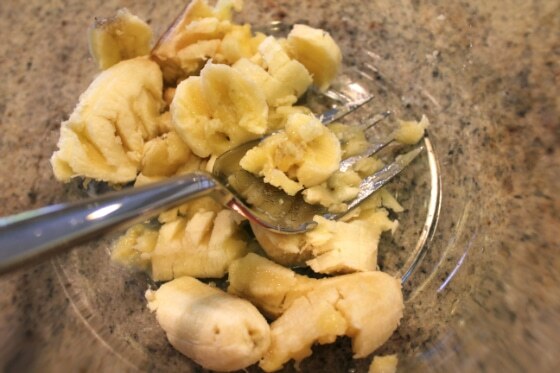 In a medium bowl, mash the ripe banana with a fork. 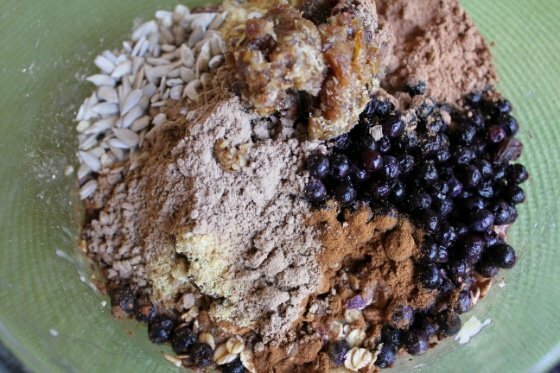 Add the oats, blueberries, pomegranate juice, raisins, sunflower seeds, ground flax seed, cinnamon, cocoa powder, and protein powder (optional) and stir to mix well. Press the mixture into your baking dish and bake for 20-25 minutes. For easier slicing, let the bars come to room temperature. Join my weekly newsletter list! I’ll e-mail you once a week with a summary and links to new articles, plus insider info and bonuses available only to subscribers. This keeps you from having to keep checking my site for new blog posts. Those look delish! And more importantly, super healthy. Nice job! those bars look so gorgeous and healthy I love on the go snacks! I found some gluten-free oats this weekend. This recipe makes me wish I had gone ahead and bought them. I’ll bookmark it and get them next Saturday. Great idea Johanna! How wonderful that you can find gluten-free oats. Enjoy the bars! They sound awesome, but I have some questions as I am still new to cooking healthier. Our local grocery store has a health market, plus we have a health food/organic grocery store. Where in these places do I find flax seed, hemp protein powder and cacao powder? These bars look yum-o. I’m a big fan of bars in general. You’re always doing the healthiest food challenges. I cant imagine eating no oils. I’m glad you are finding tasty recipes. These looks awesome! I am always looking for easy to make bars like this. Wow that looks wonderful! I love this line “each ingredient is health-promoting” That’s how all recipes should be! YUM! Love bananas and chocolate together. Your so inspiring. I have read Dr. Fuhrman’s Eat to Live book and I really want to do the program. Do you have any tips? Would you recommend that people ease into the program or just do it cold turkey? Thanks! Hi Mallory! I would recommend following the 6-week program that Dr. Fuhrman outlines in his book. You’ll note that he describes that you may not feel well for the first several weeks while you are withdrawing from caffeine, sugar, salt, etc., but pretty soon you’ll start to feel much better as your body adjusts and you start to lose excess weight. Good luck!!! I know this is an older post, but I’m loving your site. You are glowing and I can’t believe you are only a year younger than me! I started a loosely followed Eat to Live plan about a month ago, and have lost some unwanted pounds. These bars are the perfect thing to prevent me from pigging out on holiday goodies. Made them this morning, yummy! Thanks for the sweet message, Carisa! 🙂 I’m glad you are doing well on Eat to Live, that’s great!!! Oh, I’m so excited to have found this recipe (and your blog) – they look so tasty! Have you updated the recipe? I don’t remember there was apple sauce in it and I’m sure it had hemp powder in it before! I just tried these! I didn’t think they would hold together because the mixture looked so crumbly! I was so surprised that after they were cooked they actually have held together really well and they taste delicious 😀 Thanks for this recipe! Chocolate and banana together, I love it! Based on the ingredients I came out with WAY different nutritional information using a site that’s usually spot on. Thanks, Jackson! I’ve updated the recipe with the correct info.